The Tick is an American web television series created for Amazon Video by Ben Edlund, based on his comic book character of the same name. Its pilot premiered on August 18, 2016. A "half-season", through to the sixth episode, was released on August 25, 2017, and another six episodes were released on February 23, 2018. On January 17, 2018, Amazon ordered a second season of ten episodes, which premiered on April 5, 2019. The Tick is a nigh invulnerable superhero in a blue tick suit who arrives in the city to help combat crime and uncover the mysterious figure behind the city's underworld. He befriends a nervous and mild-mannered young man named Arthur who becomes his sidekick. They come to realize that an apparently long-dead supervillain called "The Terror" may still be pulling the strings in the city's underworld. In March 2016, it was announced that Amazon Video had ordered a pilot for a The Tick reboot with Peter Serafinowicz starring as The Tick along with Griffin Newman as Arthur. Co-starring in the pilot would be Valorie Curry as Arthur's sister Dot and Brendan Hines as Superian. In April 2016, Jackie Earle Haley was cast as The Terror. In September 2016, Amazon Prime picked up the show for a full season of 12 episodes. On January 17, 2018, Amazon ordered a second season of 10 episodes, premiered on April 5, 2019. The pilot of The Tick premiered on Amazon Video on August 18, 2016. The first six episodes of the first season were released on August 25, 2017. The remaining six episodes of the first season were released on February 23, 2018. In a world where superheroes and supervillains are real, unassuming office temp Arthur is traumatized by the supervillain The Terror, having watched his actions lead to the death of his father when he was a young boy. While authorities and the superhero Superian believe The Terror has died, Arthur tracks evidence of a conspiracy theory that he is still alive. He tracks The Terror to crime boss Ramses IV and the Pyramid Gang, and witnesses Miss Lint, a villain with electrical powers and the former right-hand of the Terror, as well as Ramses's henchmen, obtain a strange package. While spying on them, Arthur is discovered by the Tick, who takes a keen interest in his sense for justice, but events lead to Arthur being arrested. His sister Dot comes to free him, asking him to take his medication and stop tracking this conspiracy theory. The next morning, Arthur finds the Tick in his bed, having stolen the package (destroying the facility in the process), which is revealed to be a superhero-like suit which the Tick wants Arthur to wear. Arthur orders the Tick to leave, and then tries on the suit for himself, just as he is attacked by Miss Lint and the henchmen. The Tick arrives, throws Arthur out his window to save him, and easily defeats Miss Lint's gang, in the process causing Miss Lint to lose her grounding. Arthur flees and tries to hide but is later found by the Tick. Arthur starts to wonder if the Tick is just a figment of his imagination, but Dot then shows up, as Arthur had not returned her calls, and assures Arthur she can see the Tick, whom she had heard about when stitching up some of Ramses men caught in the explosion caused by the Tick. She warns Arthur to stay away from the Tick, and that he has work the next day. Miss Lint reports her failure to regain the suit to Ramses, who threatens her to recover the suit or be killed. That night, Arthur, still wearing the suit, finds himself trailed by some Ramses henchmen, just as Overkill arrives and brutally murders them all. Overkill threatens Arthur, as he also wants the suit, but the cops arrive, and he runs off, leaving Arthur alone. Arthur feigns being a superhero to clear himself of the crime and returns to his apartment just as Miss Lint arrives. She knocks him out and takes the suit, but also sees one of Arthur’s newspaper clippings related to The Terror and takes it too. Arthur wakes up and is nearly late for work, unaware that Overkill is tracking him. When the Tick tries to tell him to skip his job, Arthur learns the Tick only has memories since when they met. He convinces the Tick to seek out the identity of Overkill as he works. While at his job, Arthur is attacked by Overkill but the Tick comes to his rescue. The two fight and Overkill kicks the Tick out the window. The Tick crashes to the ground but is unharmed. Overkill learns Arthur no longer has the super suit, but takes his file on The Terror, impressed with the quality of Arthur’s research. Dot reminds Arthur that today is his step-father's birthday party, and he reluctantly attends. The Tick crashes the party. Miss Lint learns that the suit imprinted on Arthur, making him the only one who can use it. She arrives at the party and forces Arthur to put on the suit. He does so, and the two scuffle, which ends Arthur flying out the window. The automatic controls of the suit causes Arthur to start flying uncontrollably across the city. Arthur manages to call Dot and has her and the Tick help him as he finds a way to gain control of the suit and lands. Just as the Tick and Dot arrive, Overkill also appears, demanding Arthur turn over the suit, but the Tick steps in to defend him. Ramses and the Pyramid gang, who had been tracking the suit, appear, and a firefight breaks out, but the Tick and Overkill easily defeat the men. Overkill takes an unconscious Ramses into his possession. Arthur, Dot, the Tick, and Overkill agree to work together to discover the secret behind the suit, and learn that it was created to fight an alien, specifically Superian, the first superhero. When they learn Ramses wants it, they deduce that Arthur was correct, that Ramses is working for a very-much alive The Terror, who appears in Miss Lint's apartment. While Overkill wants to kill Ramses, Arthur insists they drop him off at AEGIS, the agency that oversees superheroes and supervillains, but find the office had been closed years prior. He and the Tick are attacked by the Pyramid Gang to rescue Ramses, and while they are uninjured, their attack sends a bus over the edge of a bridge. The Tick and Arthur successfully rescue all the passengers in front of numerous eyewitnesses, making them heroes to the city. Meanwhile, The Terror explains to Lint how he needed to fake his death to encourage Miss Lint to take her own actions. Inspired by his words, she goes and kills Ramses. That evening, as the Tick and Arthur celebrate their new celebrity, Arthur is kidnapped by an unseen assailant. While the Tick discovers Arthur missing, Arthur awakens in a dark room, where he is approached by the Terror. The Tick searches for Arthur, as does Dot. Dot arrives at Arthur's apartment, where she finds Overkill. The Tick arrives, and the three launch a plan to rescue Arthur from the Terror's lair. In the Terror's lair, Arthur finds that his cell is adjacent to the cell of Dr. Karamazov, the man who designed Arthur's suit. Ms. Lint provides Arthur with his suit and a means to escape. This, however, is a set-up by Lint and the Terror. Arthur rescues Karamazov, who has been shrunk and is only half Arthur's size. The two escape, but Karamazov punches Arthur in the groin and flees. Tick and Overkill storm the Terror's lair, but he and Lint escape and bomb the lair. 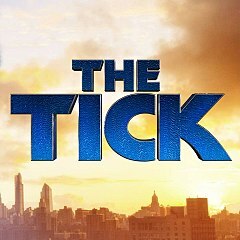 With the Terror's location now unknown, Arthur decides to go on the move with the Tick to avoid danger, enlisting Tinfoil Kevin, the homeless man who lives outside Arthur's apartment, to watch the apartment. Arthur and Tick want to inform Superian of the Terror's plot to kill him, while Dot begins to practice shooting a gun, and Lint takes control of the Pyramid Gang. Arthur and Tick go to a book signing event of Midnight, a talking dog and former member of the Flag Five, a superhero group that Arthur idolized and the Terror killed, in order to give Superian their message. Arthur deduces that Overkill is a former member of the Flag Five, who survived the Terror's onslaught. Overkill confronts Midnight, but Midnight refuses to believe that the Terror is alive, and the two scuffle. Meanwhile, a strange car follows Arthur. The Terror takes control of Brown Tingle Cola, a soda company he founded, using its office as his new headquarters. Arthur and the Tick are approached by two diplomats (a woman and a robot) from Karamazov's home country, who are searching for Karamazov, as the Terror left a tip to the embassy that Karamazov has defected from the country. Dot bonds with Overkill, who teaches her to shoot. Arthur and Tick search for Karamazov, as he is their only link to the weapon to kill Superian. They find him, but his body has shrunk further but has a normal sized head. The female diplomat chases Arthur, exploding the baby stroller which she believes contains Karamazov, but following her departure, the stroller is revealed to contain a frozen turkey given to Arthur by Kevin. Meanwhile, the Terror sets his plan in motion, revealing that the VLM, a man as tall as a skyscraper which has been monitored by the military and Superian, is a crucial part of this plan, with the VLM revealed to be the man who found the Terror's teeth when Superian 'killed' him. Arthur and Tick take Karamazov to Kevin's 'office' in an old robot head to nurse him back to health. Arthur and Tick return to Arthur's apartment to find a delirious Superian, who faints. Karamazov, now in a robot suit fashioned by Kevin, tells Arthur and Tick his story. He discovered a supply of "big bismuth" in the mountains of his own country, which he used to create a growth ray. He tested it, with Superian in attendance, but it malfunctioned and shrunk Karamazov. Karamazov's government seized his weapons to fight Superian, but the Terror seized the weapons from them. Karamazov reveals that his weapons cache and his supply of big bismuth was destroyed by the Tick (as seen in the pilot). Karamazov further reveals that big bismuth is responsible for Superian's sickness and the growth of the VLM and that the Terror plans to use the big bismuth inside of the VLM to kill Superian. Meanwhile, Dot gets word of a Pyramid Gang mission, and she and Overkill go to stop it. Overkill challenges Lint, who subdues him with gas. Dot shuts off the power to the building, but Lint uses her electrical powers to restore power, which sends out a ray, hitting the VLM, causing him to move towards the city. Karamazov reveals this is the beginning of the last part of the Terror's plan. As the VLM approaches the city, Karamazov clarifies to Arthur that the Terror's plan is to use the big bismuth in the VLM as an explosion, which will kill Superian, as big bismuth is his weakness. He reveals to Arthur that his suit functions as the 'detonator.' Karamazov alters the catalyzer, disabling Terror's remote detonation. Karamazov also alters the catalyzer so that the detonation will shrink the VLM to normal size, but tells the group that there is only a 20% chance of success. Lint confronts Overkill, and their conversation reveals a past relationship between the two, also revealing that Lint used Overkill to allow the Terror to kill the Flag Five. They share a moment, with Lint offering to help Overkill, revealing the Terror's location to him. However, Overkill declines, not trusting her. Dot activates the sprinkler system and rescues Overkill. Arthur and Tick arrive at the military blockade, where they share a heart-to-heart before preparing to stop the VLM. Arthur prepares to activate the catalyzer, but is stunned by the sudden appearance of Superian. The catalyzer works, shrinking the VLM, with Superian surviving. His plan foiled, the Terror decides to attack the Flag Five memorial ceremony, which Arthur's mom and step-father are attending. Arthur and the Tick intercept the Terror at the memorial. Tick attacks Terror's ship while Arthur dispatches his goons. The Tick tears through the hull, leading the Terror to attempt to abandon ship, but Lint takes the escape pod before he can. The ship crashlands, and Arthur confronts the Terror. The Terror prepares to kill Arthur, but Superian arrives, subduing the Terror with his frost breath power. Arthur and Dot reunite with their family, while Superian is hailed by the public for stopping the Terror. Overkill laments that he was not the one to stop the Terror, but Dot tells him that he will likely escape; Overkill thanks Dot for making him feel better. Arthur and Tick converse with Midnight, who tells the two to tread carefully in the public eye, and that "Big Brother is watching", but leaves before Arthur can learn what Midnight means. As Arthur and Tick walk away, an AEGIS drone is seen behind the pair, before it flies up and regroups with several others. Review aggregation website Rotten Tomatoes reported a 90% approval rating with an average rating of 7.4/10 based on 61 reviews. The website's critical consensus reads, "Likeable characters add realism and heart to the tongue-in-cheek humor and high-octane action that fuels The Tick." Metacritic, which uses a weighted average, assigned a score of 72 out of 100, based on reviews from 23 critics, indicating "generally favorable reviews". Rick Austin of Fortress of Solitude gave the show a score of 4/5 and felt that the show had managed to fix several of the flaws he saw in the pilot episode. He concluded, "With so few good superhero comedies out there, this is exactly the show the world needs." The second season has a 100% approval rating on Rotten Tomatoes, based on 7 reviews, with an average rating of 8.33/10. In 2018 the series was nominated for a Saturn Award in the category "Best New Media Superhero Series". ^ a b Li, Shirley (February 27, 2019). "The Tick Season 2 trailer and release date revealed". Entertainment Weekly. Retrieved March 4, 2019. ^ Narcisse, Evan (August 28, 2017). "The New Tick TV Show Has a Sneaky Tribute To the Character's Classic Cartoon Series". io9. Gizmodo. Retrieved January 15, 2018. ^ Andreeva, Nellie (April 14, 2016). "Jackie Earle Haley To Co-Star In 'The Tick' Amazon Pilot, Joins 'The Dark Tower' Film". Deadline Hollywood. ^ Osborn, Alex (September 27, 2016). "Amazon Orders The Tick and Jean-Claude Van Johnson to Series". IGN. Retrieved October 11, 2016. ^ Pedersen, Erik (May 26, 2017). "Summer Premiere Dates For New & Returning Series: 2017 Edition". Deadline Hollywood. Retrieved June 12, 2017. ^ Patten, Dominic (October 6, 2017). "Amazon's 'The Tick' Set To Return In February – NY Comic-Con". Deadline Hollywood. Retrieved October 7, 2017. ^ "The Tick – Listings". The Futon Critic. Retrieved March 17, 2019. ^ "The Tick: Season 1". Rotten Tomatoes. August 30, 2017. Retrieved January 6, 2019. ^ "The Tick (2017) - Season 1 Reviews". Metacritic. August 30, 2017. Retrieved August 30, 2017. ^ "Amazon's The Tick Season 1 Review - I Love This Show!". Fortress of Solitude. August 28, 2017. Retrieved December 21, 2017. ^ "The Tick: Season 2 (2019)". Rotten Tomatoes. Retrieved April 12, 2019.